Super Mario: Endless Earth is an open-world 2D Mario game. Explore a gigantic world and attempt to track down Bowser's hidden fortresses to rescue the all-powerful Eternal Star Shards. There are eight objectives, replacing the 'worlds' from previous Mario games, and each one contains a unique fortress level with multiple routes. 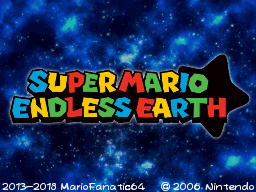 Super Mario: Endless Earth has a fully scripted story with opening and closing cutscenes. Bowser has invaded a world hidden within the stars, and it's up to Mario to stop him from using the power the Eternal Star within to cause great calamity. New Super Mario Bros. has been heavily modified into a whole new beast of a game.